Best way to mount SSD and HDD Advice? Potentially a big newbie question but got to start somewhere! I've been looking in to this for a while now and struggling to find a solution that I understand so hopefully someone else has a set up which is similar to what I want and can give some advice. I have a 125gb SSD which I am currently booting from and also storing everything on, software, games, files etc. However i also have a 1tb HDD which would be a much more suitable device to store everything on. So ideally I would like a set up which tells my PC to boot from the SSD but after that just use the HDD, is this possible? Would there be any benefit to keeping some items such as software on the SSD (from a speed perspective) and how would this be achieved if so? I'm willing to do a complete re-install of Linux if that helps the process and in the past have tried mounting the HDD as /home and the SSD as / but this has not worked for me (probably because I'm doing it wrong). Re: Best way to mount SSD and HDD Advice? So ideally I would like a set up which tells my PC to boot from the SSD but after that just use the HDD, is this possible? That sounds like a separate boot partition with the rest of the OS on the HD. Would there be any benefit to keeping some items such as software on the SSD (from a speed perspective) and how would this be achieved if so? I have a 125gb SSD which I am currently booting from and also storing everything on, software, games, files etc. However i also have a 1tb HDD which would be a much more suitable device to store everything on. You might eventually come to realise that that's a complete waste of 100GB or so of high-speed SSD. You only need around 30GB for the OS, depending on your needs maybe 50GB. If you put everything onto the HDD then that space on your SSD goes unused. You're better off keeping things that you need regular access to in your /home directory on the SSD and using the HDD for all other things, including backups. This is how I do it myself. nearly everything I need or want is stored on just the SSD, and backed up on the 2nd half of the SSD, and then a 6TB HDD backs up everything again. You can see here that I also have the 1/2 half partitioned off again and running LMDE3-Cindy on it. 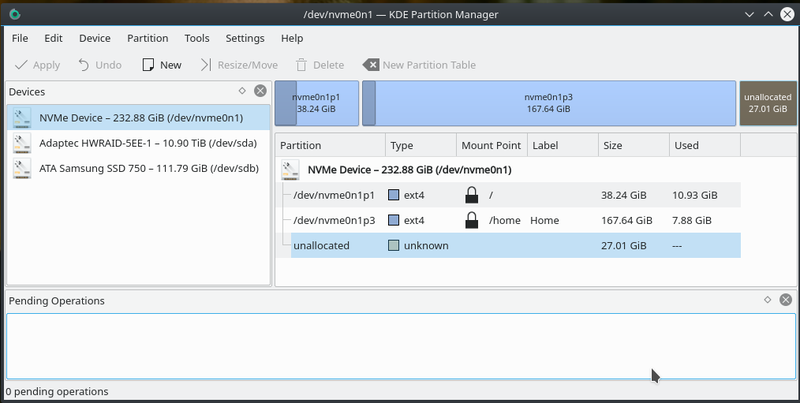 You might want to shrink that right-hand partition by 75GB (15%), or at least 50GB (10%), and leave the space unallocated, i.e. don't partition it. This will cause the SSD controller to use the empty space to greatly extend the life of your SSD. If you need more information, search for over-provisioning. that is on tomorrrow's To Do list. I'd put both / and /home partitions on your SSD and then mount your 1TB HDD as something like /home/you/data. That way the OS is on the fastest device, stuff that you use frequently is also on the fastest drive and other stuff can live on the HDD. This is a similar setup to my home brew desktop. It has a 120G SSD for / and /home and a 1TB HDD. I've split the HDD, 300G for data and the rest for backup. You get the UUID by typing blkid into a terminal. Thanks for the advice, I think I have it set up how I like it, although even though I've set the HDD up to be mounted on startup Steam doesn't seem to recognise that its there until i manually go to 'Computer' on my desktop and at least select the HDD. Once I've done this then Steam recognises all the installed games on it. Only a minor issue but it'd be nice to just go straight to Steam and play games without having to select the HDD before. I have everything on the SSD, and back it up to HDD. this lets me benefit from the SSD's speed in reading/writing to files. Every thing in this Gparted image is my 500gB SSD, it is partitioned to allow me to make as much use of it as possible. I have a crontab job that runs fstrim daily to free up space after something is deleted. the newer SSDs do not suffer from the write/delete/write/delete problems like they use to. lol - that was copy pasted from my post higher up, mate.